Met an amazing knitter, Luz, designer of the most beautiful jacket known to man. 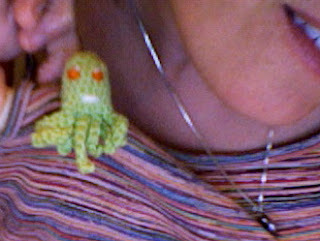 Was given an octopus with orange eyes, item coveted by me for weeks. Proving that you don't have to be at all normal to be a part of this excellent group. Just brilliant. Held in my hands and read an Encyclopedia of "Labores de Señora" (I think that was the title) written by one Therése de Montdill in the 19th century and which Rosa has been lucky enough to be consulting since she was a kid, which is no doubt why she can whip up a super-complicated lovely lacy stole in one month. It's really late, gotta go. More tomorrow. Tu también eres excepcional, igual que todos tus tejidos! mira que el jersey que estás haciendo es de nivel avanzado, y me dijiste que no habías tejido antes ... y tú como si lo hubieses hecho durante toda la vida! increíble!